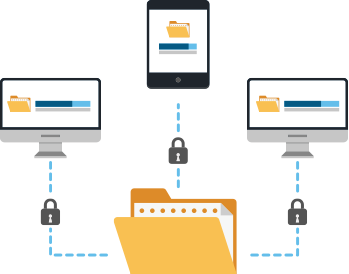 Gladinet secure file sharing helps you focus on your business. Gladinet lets you quickly and easily collaborate securely with anyone. Share large files and connect with coworkers and partners on any device in any location. External File Sharing – Tired of using FTP and email to transfer files? Use Gladinet to send shared links to anyone. Control security with granular access permissions, passwords, guest users and expiration dates. Internal Team Folders – Use Gladinet’s Team Folders like file shares in the cloud. Universal Access – Members of your team can access shared content from any location with any device using their existing identity. Attached Folders – Share directly from your PC or file server using our patent pending attached folder technology. Attached folders are immediately available over the internet, before the full upload is completed. File Versioning – File changes create new versions of files. Control how many versions are kept and for how long. Easily restore old versions and undelete. File Comments – Add comments to files and folders in team folders. File Server Integration – Want a highly available hybrid environment? Attach local folders to cloud storage to keep them available offline via efficient 2-way synchronization. File Share Migration – Migrate existing file shares to cloud storage with existing permissions. Auditing and Reporting – Keep track of who’s sharing what with whom.